The Blue Mountains is part of the great dividing range, one hour from Sydney featuring mountain villages, bushwalks, lookouts, and many other tourist attractions. Come and enjoy the untouched splendor of nature and local wildlife. With this app you will be able to explore the area with self-paced tours that include audio, video, photos and 360 degree panoramas - A tour Guide in your pocket. Find accommodation and parks in the area with our growing list of points of interest. With turn-by-turn directions and one tap to dial you will be able to get around town effortlessly. 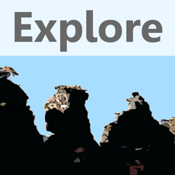 A must have app when you visit Katoomba, Echo Point and the Three Sisters.